Hublot has joined the Bitcoin watch mini trend, with the launch of the new limited edition Big Bang Meca-10 P2P to mark a decade since the crypto currency’s birth. The Big Bang Meca-10 P2P is a limited edition of 210, the number a reference to the global limit of Bitcoins, which is fixed at 21 million. Naturally, its purchase is exclusively online using Bitcoin payment, through a collaboration with OS Limited. Each watch features the transaction number engraved on the edge of the bezel, rendering each piece unique. The watch in question — that launched this entire project — is a limited-edition version of the Big Bang Meca-10. Rendered in a micro-blasted and polished black ceramic case and bezel, with the unique identification number of the transaction made via Bitcoin, etched on the bezel’s edge. The new ‘P2P’ is in a 45mm micro-blasted black ceramic case, with black PVD titanium ‘H’ screws and a water resistance of 100m. The skeletonised dial is characterised by the use of dark blue for the ring, seconds sub dial, and the Bitcoin symbol bedecked power reserve indicator. The satin-finished black-plate indices and hands both have dark blue lume. The sapphire crystal atop the dial has a Hublot logo printed on the inner side. The crown is satin-finished and micro-blasted black PVD titanium with a black rubber insert. 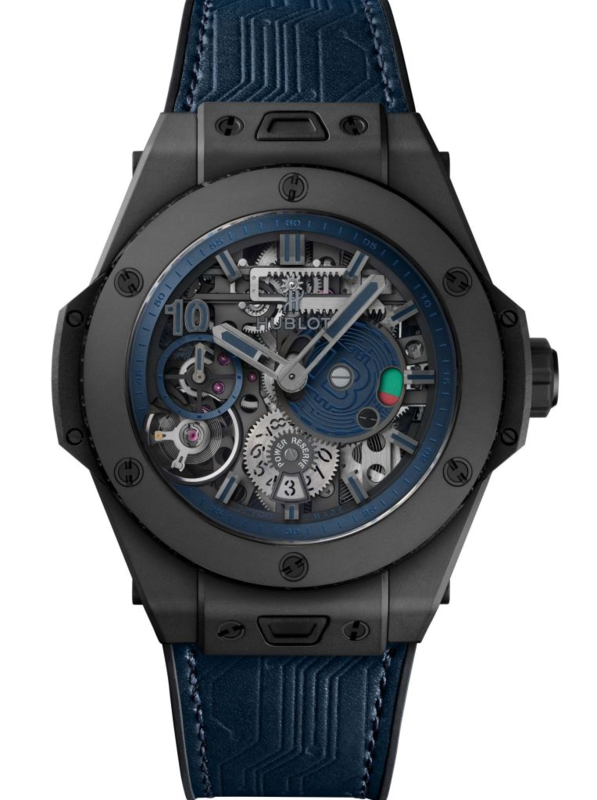 Powering this new watch is the Hublot Calibre HUB1201, with a ten day power reserve. This movement was chosen because of it being a ten year commemorative piece. Covering the movement on the case back is a sapphire case back decorated with what is meant to be a signifier of electronic networks. The black and dark blue theme continue to the rubber and calf strap, which comes on a black PVD titanium buckle with black ceramic deployant. The watches are essentially made when ordered, with each of the two hundred and ten pieces bearing the transaction identification number engraved around the case. With a price of USD$25,000/ equivalent in Bitcoins, click on this link for further information.